Diane Kurzyna aka Ruby Re-Usable is one of our heroes. 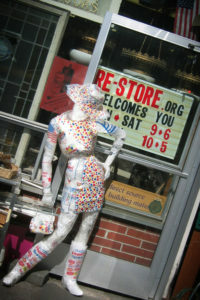 She has been an integral member of The RE Store’s annual Recycled Arts & Fashion Show for close to a decade. She has served for years as a jurist, promoter, networker, and a designer of pieces for the Trash Fashion Shows. Her network of artists and designers have brought some of the most inspiring, unconventional and thought-provoking art to the Show over the years. In December 2003 I had a show of icon imagery in the chapel of St. James Cathedral, Seattle. When taking down the show, I noticed a sacristan changing out the burned down votive candles, replacing them with new ones. When I saw him doing that I realized that each piece of aluminum represented someone’s prayer so I asked if he would mind saving them for me. A couple of months later, in 2004, they called and told me they had a box for me to pick up. I wasn’t sure what to do with them so I put them in the attic where they sat for a couple of years. In 2006 I saw a call for entries for the Seattle RE Store’s Recycled Art Show. I thought of my recycled prayers in the attic, hauled them out and starting playing with them trying to come up with ideas on how to use them. I finished my piece and entered it in the RE Store’s juried show. It was accepted and turned out to be a great success for me. I later sold the piece and since then have made over 40 works using the recycled prayer wick tabs. View examples of Patti’s work on her website.